Mail+ for Enterprise combines a user-friendly experience with the power of Microsoft ActiveSync connection. IT administrators can customize access to their Exchange environment and control various policies such as passcode requirements, remote data wipe, and encryption. Implementing Mail+ for Enterprise means your employees stay connected in a secure and headache-free way. 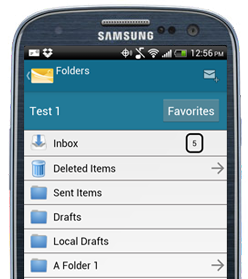 Mail+ for Enterprise is also available on Android platforms so you can manage all of your enterprise needs. Mail+ on Android includes a unique user interface that Android users will instantly be familiar with. Mail+ for Android has two way synchronization for email, calendar, contacts and also implements ActiveSync policies such as passcode. Note: this is only available with APK distribution. Outlook and ActiveSync are registered trademarks of Microsoft Corporation. Gmail is a registered trademark of Google. This application has been developed by a third party developer and is not endorsed, tested, or associated with Microsoft Corporation or Google.